We added a third property (4th garden) on Manierre Road, which will allow us to rotate crops more effectively in the future while keeping equipment and volunteers centrally located. Though our tomato production was lower than prior years, the use of row cover allowed us to generate a healthy zucchini and cucumber crop to offset the difference. Fruit continued to be a big contributer, with almost 1/3 of our season total coming from local orchards. As a result 2015 was a record year, with over 70,000 pounds of fruit and vegetables harvested for 17 local food pantries and soup kitchens. We got the root knot nematodes and broad leaf weeds under control only to experience herbicide damage while using alpaca manure. We built a shed at the Lynn garden early in the spring of 2014, allowing us to keep more equipment and supplies on-site. We upgraded the weighing system to accommodate pallets. The squash bugs, which had been steadily increasing in number from year to year, overwhelmed us entirely. All melons, zucchini, squash and cucumbers were lost. Fortunately the local orchards provided a lot of fruit and we were able to donate almost as much as 2012. 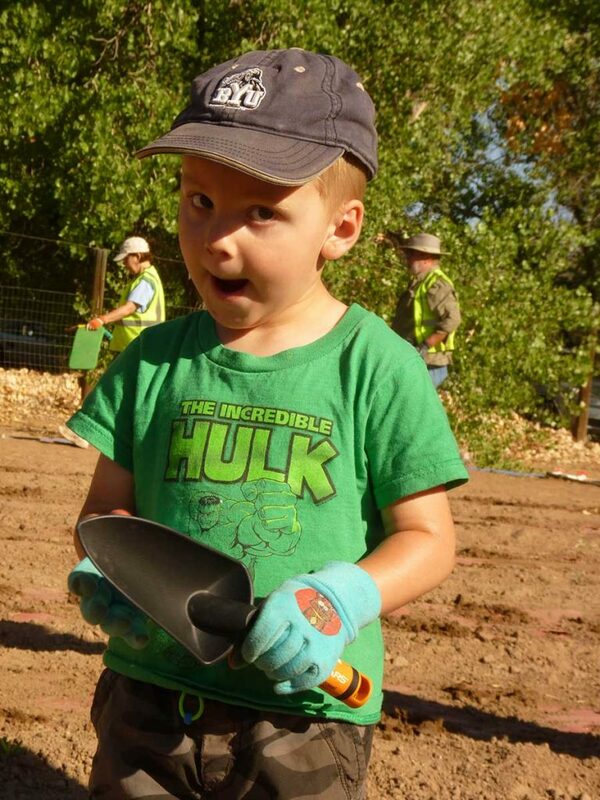 We finished planting the fruit trees purchased with the 2012 Keep New Mexico Beautiful grant. We purchased a plastic mulch layer attachment for the tractor, allowing us to put down the t-tape irrigation and plastic mulch faster and more efficiently. The ongoing drought made the year challenging. We realized that the plastic mulch was useful to inhibit weed growth and to conserve water. Root knot nematodes were discovered at the Scherzinger garden when the plants failed to develop properly. Despite setbacks we donated 41,199 pounds of produce. After two years working with a non-profit as our sponsor, Seed2Need officially became a 501(c)3 in June, 2012. With a generous donation from PNM we constructed a greenhouse on the property of Richard and Judy Jacobs. The fruit crop overwhelmed everyone with trees. Many orchard owners contacted us to harvest their trees for donation. This has become an ongoing initiative, augmenting the vegetables provided with a variety of fresh fruits. More land was cleared at the Lynn garden by Eagle Scouts. 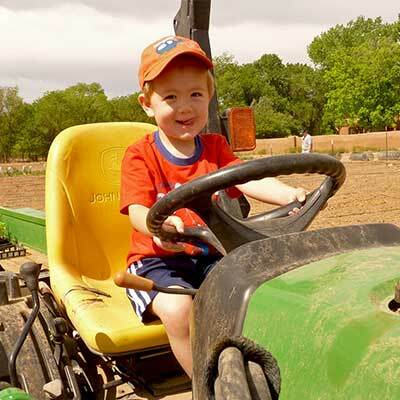 Keep New Mexico Beautiful gave us a grant to plant an orchard. New Mexico’s weather was volatile in the spring, with an unusually late frost at the end of May followed by record heat three days later. The newly sprouted green beans froze and the spring crops bolted. However, expansion at the Lynn garden allowed us to plant more than 2010. As the tomato harvest peaked we overwhelmed the pantries we serve. We sent the excess to Roadrunner Food Bank for rapid distribution to other food pantries in the area. In turn Roadrunner provided us with crates. The crates can be cleaned, transport well and weigh under 50 pounds consistently. Victor and Nora Scherzinger donated their land in 2009, but it was only about 1/10th of an acre. It generated just over 1600 pounds of produce. That garden was expanded to almost 1/2 acre in 2010. Victor talked his neighbors into donating 1/2 acre on their property as well, with a total garden space of about .8 acre planted in May, 2010. The Master Gardeners got involved. Rio Grande Food Project was our non-profit sponsor as we raised funds to start building the infrastructure needed to grow on a larger scale. 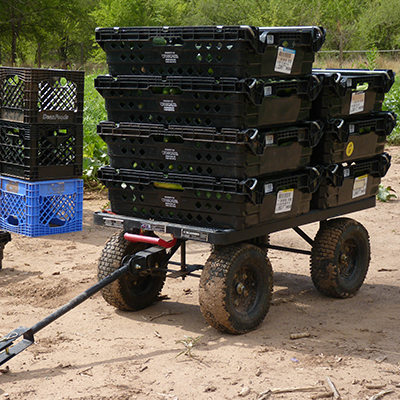 Over 30,000 pounds of produce was generated. Highlights: Covering the squash and cucumbers allowed us to harvest before the squash bugs killed the plants. We added a 3rd garden. Tomatoes were disappointing, but working with local orchards offset the shortage resulting in our best year ever. Highlights: We got the root knot nematodes and broad leaf weeds under control and built a shed on site for storage of equipment. The squash bugs annihilated all squash, melons and cucumbers. We also experienced herbicide damage. Highlights: Officially became a 501(c)3. Harvested a bumper crop of fruit, resulting in the implementation of gleaning as an ongoing initiative. Built a greenhouse. Donated 65,238 pounds of produce to 15 pantries. Highlights: 45,400 pounds of vegetables donated to 10 food pantries and 1 soup kitchen, representing almost 15,000 pounds over the 2010 total of 30,701 pounds donated.